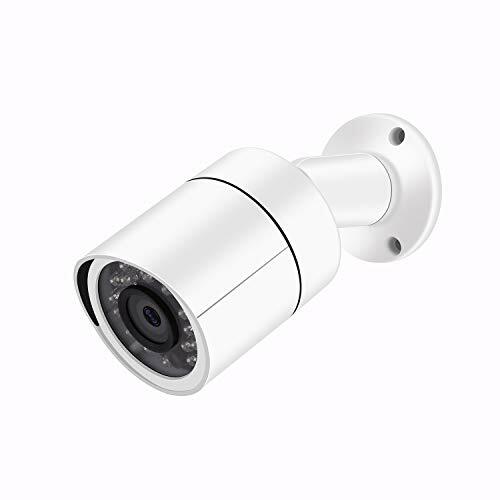 This Dericam 1080P 3-in-1 bullet camera is designed for your home and business security needs of indoor or outdoor. It is easy DIY installation and can be plug and play for the NTSC mode security DVR system. This standalone camera does not come with the DVR, Power Supply and Coaxial Video Cables are required and sold separately. The sticker on the cable will show you how to switch among different video mode. -Locate the position in the place you desire to place the camera and apply the included mounting sticker to the surface. -Using a drill bit of same diameter or slightly smaller than the included drywall mounting sleeves (Included together in the bag of screws). Drill out the smaller circles on the sticker and insert the sleeves. -Thread the included screws through the camera base and into the drywall mounts. -Loosen the adjustment screws near the camera base to adjust the position of the camera as desired. Then tighten the screws to complete the mounting. -Image Sensor: 1/2.7” 2MP CMOS Sensor, high resolution 1080P 3-in-1 HDCVI/HDTVI/AHD. -Lens: 3.6mm/Viewing Angle: 85°/Night Vision: 24 LEDs up to 82ft distance. -Transmission distance: Reach more than 984ft/300m based on 75-3 coaxial cable. – Power Supply: DC 12V. High Resolution 1920×1080@30fps/1920 TVL for crystal clear and fluent video. 3-in-1 2MP Security Camera, HDCVI is default. Compatible with HDCVI/HDTVI/AHD Security DVR System, Output Selectable from Toggle Switch. 24 Powerful IR-LEDs for Night Vision up to 82ft, IP66 Weatherproof, Long Distance Transmit Range up to 984ft. Noted: This camera does not come with DVR, Camera’s Power Supply and Coaxial Video Cables but are required and sold separately. 12 Months warranty & Lifetime support, any issues of refund/replace/technical question, please email to support@dericam.com.